I Got Mail – A Handwritten Letter! Dear Aunty: A handwritten letter from my nephew, Nicholai. As I do must days, as usual, I got mail today. But it wasn’t the usual mail. Okay, maybe my Verizon mobile bill was part of the usual mail, as was the alumni correspondence from grad school, but the “via air mail” envelope with a postage stamp from Barbados – that was definitely unusual. Breaking the seal, I opened far more sunshine than beautiful Barbados boasts in its 365-day-a-year of sea and sun. 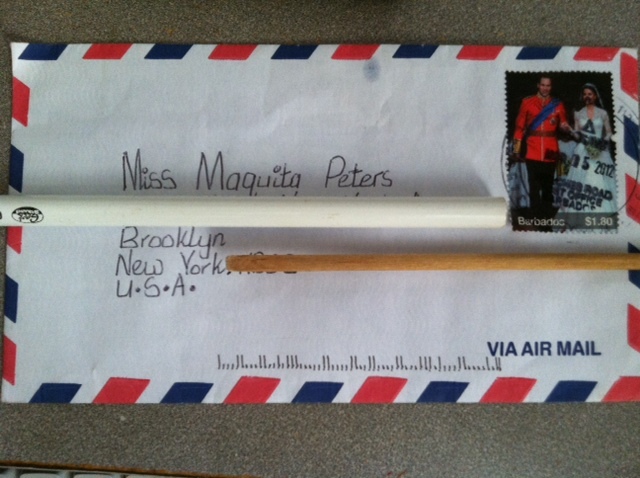 I opened a handwritten letter from Nicholai, my 10 year-old nephew. The first thing that grabbed my attention was his impeccable penmanship. From the carefully poised address and date in the upper right corner, to his salutation, “Dear Aunty,” to his endearing sentiments and descriptive storytelling, I marveled at Nicholai’s expertise with ink. But what impressed me most was the clarity with which he expressed his feelings and his command of the English language: grammar, syntax, punctuation etc. In this digital era where crafting thoughts can now be encapsulated in tweets of 140 characters via a computer, tablet or mobile device, these skills exhibited by Nicholai and in particular, the handwritten letter are almost seen as a dying art. Let me make it clear that I wholeheartedly embrace technology and social media. I am a proud Mac owner. I have owned different versions of the iPhone from almost the moment it arrived on the market in 2007. I have active Facebook, Twitter, Google+, Pintrest, Vimeo, YouTube and LinkedIn accounts. And until recently, when I deactivated my membership on Foursquare after an unfortunate incident, I was holding down the mayorship of more than 50 places. I enjoy engaging and interacting on all these media, the spontaneity they allow in relaying messages, how they provide a wealth of information at a click and the role they have played in affecting positive change in society. My iPhone ensures ready access to all these and is one of the prized items on my proverbial list of “Things I Cannot Live Without.” Still, there is something authentic about the feel of the New York Times in my hand – a reason why I’d subscribed to the NYT Weekender. There’s still something magical about beholding a gorgeous family photo, framed and mounted in one’s living room. And there’s something about getting mail, which doesn’t remind us about a bill due or outstanding tuition debt from grad school. There’s something about getting a heartfelt handwritten letter. 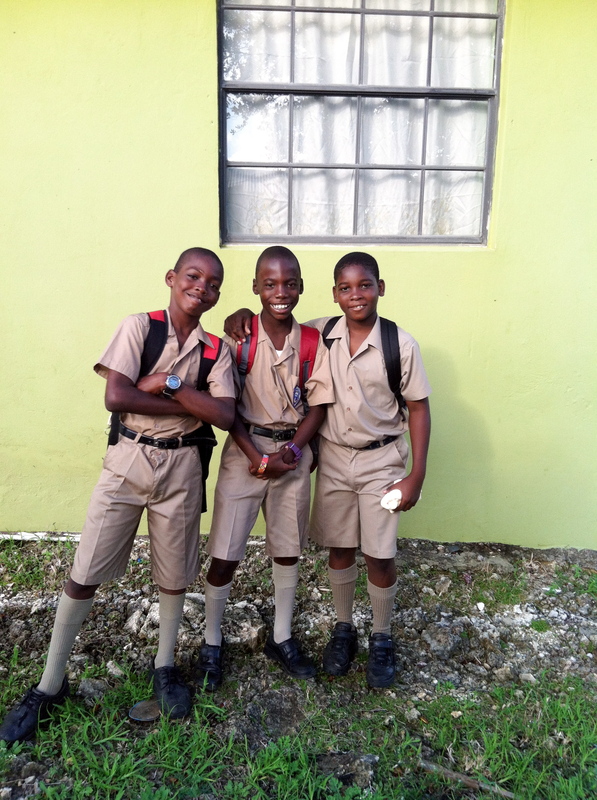 My nephew Nicholai (center) and his friends on their way to school my last day in Barbados. I last saw Nicholai over the Christmas holidays when I was in Barbados. On my first morning home, he picked up fresh eggs from my mother’s chickens and made me breakfast. Over the next two weeks, we spent time watching television/movies, reading, playing games, he accompanied me to visit “long-lost” friends in the neighborhood and we had our outings with my mom and sister. A couple days before I returned to New York (the second week of January), I took him for a day out with me across Barbados. We started out in the capital, Bridgetown at The Barbershop, where he got a fresh cut from Greg, then it was off to a lovely local restaurant, next a bus ride along the west coast, then to my friend Julie Benn’s studio (Jul-Be-Art Interiors) in the far north of the island and more. We were gone from early morning until well after sunset. It was one of the best days of my life. That day, Nicholai and I spoke about letter writing. I told him how when I was his age, I had pen pals all across the Caribbean and we’d write each other about what was happening in our lives and exchange photographs of our islands and ourselves. I told him how my dad who lived in Trinidad and I in Barbados would write each other and how happy it made me when I got his letters. Then I told him of the time when my sister, Sancia — his mom — had to leave me and relocate to St. Vincent and the Grenadines by my maternal grandmother to attend primary school there. I spoke of how much we missed each other but kept in contact by often writing letters and sharing every little detail of our lives across the ocean. It was then he promised to write to me in New York. My nephew Nicholai. 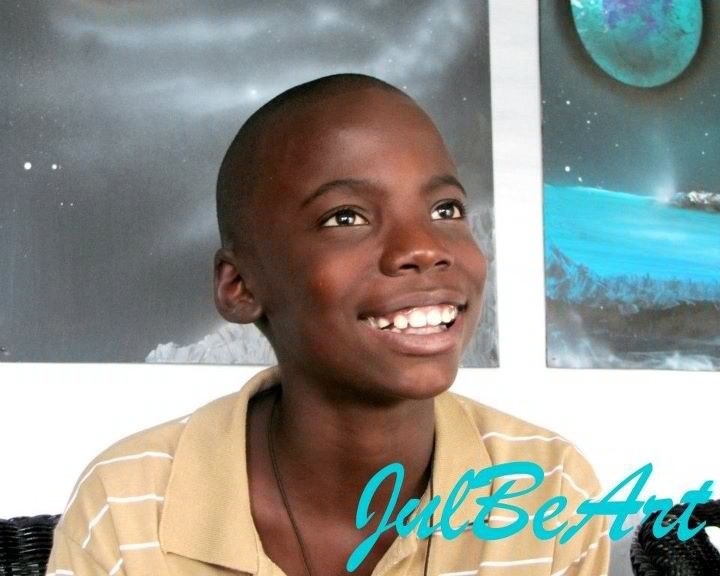 Photo compliments Jul-Be-Art Interiors, Barbados. I’ve been back in New York for more than two months and modern technology has kept me in communication with my family, in particular, thanks to the Magic Jack via which we talk regularly on the phone. I’d long given up any hope of this little boy writing to me. After all, during our conversations, he pretty much tells me everything that’s going on with him. Well, at least that’s what I thought. So indeed, it was the surprise of my life to come home to Nicholai’s letter. In his opening sentence, my nephew writes, “Since you left Barbados, I have been feeling a little lonely although there is my mother and grandmother here for me.” I did not know about that loneliness. He goes on to fill me in on what he misses about me; again I didn’t know that. Then he talks about school and track and field and how he’s been excelling in both. He shares his most recent grade – an 83% in Mathematics and performances in the100m (1st), 200m (2nd), 400m (3rd) and 400X100m relay (2nd). My tears were already flowing from a few earlier sentences, now I am beside myself with delight. As I reach his closing, “I love you with all my heart,” I cannot fathom how much more pride and joy my sister feels as his mother, because I am overwhelmed with unconditional love for this child. Emails are great, but long live the handwritten letter. My heart is full. This reminds me of when I graduated from High School (’97) and several of my friends who were more well-off financially, and who owned computers, were talking about the internet and e-mail (the good old 56k dialup days). Everyone was exchanging email addresses and promising to email each other. My friend and I, who both were not as fortunate, decided that would we write letters to each other frequently, since she was going away to school. Unfortunately, that only lasted for the summer, but it was definitely always a pleasure to get a letter in the mail. We just recently discovered some of our old exchanges some 15 yrs later, as she was once again moving. It was almost as good as receiving them in the mail the first time around. It’s definitely a missed feeling. It’s also no wonder several apps have popped up which attempt to take things from the digital realm such as photos and e-cards, and return them to the physical realm via mail. thank you for sharing your wealth. You’re welcome. Thank you for reading and tweeting it. One love. well well well…a hand written letter then. who would have thought? it’s good to know that the young man can clearly articulate his feelings and ideas through this almost forgotten medium. methinks you should keep this channel between you and the boy open for some time to come. who knows, on day this correspondence could form part of a time capsule! irieness!! bup bup, piiiaaarrrr!!! Fuh real dread! Thanks for reading and commenting Carlos! Hope yuh Irie! One love! This is sooo beautiful. As one of the teachers at his school it gives me the greatest joy and satisfaction to have read this post. I endorse your comments fully. I am privy to Nicholai’s writing skills as I have had occasion to grade some of his essays and he truly is quite articulate. It’s heartening to know that, though not financially so (smile), the profession of teaching still has its rewards. Thanks for sharing and for reaffirming my choice to join this noble profession. I’ll be sure to pass on the sentiments to my colleagues. Blessings! !